The Hampton Roads Region is filled with pre and post-colonial history. Both Colonial Williamsburg and the site of the Jamestown settlement are located here. So it contains some of the earliest English settlements in America. Martha Washington’s family home is located in New Kent County. Lafayette and Washington marched their armies through this strip of land between the York and James Rivers to engage the British at the Battle of Yorktown. The Union and Confederate armies later faced off here in what became known as the Peninsular Campaign. There are also five wineries in the Hampton Roads Wine Region. One of them just opened in February of 2014, so I was very keen on getting out there to visit Gauthier Vineyard. They have regular hours on the weekends, but I had business in the area and made an appointment to stop by on a weekday. Mo and Sandi Gauthier purchased the 110 acre Fair Winds Farm after lengthy careers in the Navy. They built both an equestrian center and a winery with the hope that it might be passed on to later generations. Their daughter, Aimee Stevenson, is the Director of Sales and Marketing. She met me at the tasting room and spent a couple hours pouring wine, showing me around and filling me in on the details of the winemaking operation. In 2011, five acres of Viognier and Norton were planted at Gauthier. Additional fruit is grown on leased property at Mount Jackson in the Shenandoah Valley and those vines were planted in 2003. The wine is also made in the Valley by Randy Philips, who is the owner and winemaker at Cave Ridge. This goes a long way toward explaining the quality wine at such a young winery. Aimee poured a total of nine wines. I found them all to be well made and of excellent quality, but there were some that I just have to tell you more about. Among the dry whites, I loved the Viognier and Traminette, but the Riesling was special. Of course the fruit is from the Valley and this is a varietal that does well over there. It was done in an Alsatian-style that was perfectly balanced and contained wonderfully crisp pear notes. This was an exceptional wine. Among the reds, there were a couple that were just crazy, out of this world good. They were both 2011 vintages, which was a terrible year and, therefore, all the more surprising. The Petit Verdot still needs another three or four years, but it was deep red with hints of leather, lots of dark fruit and a bit of spice. I thought I’d found my favorite, when Aimee broke out a bottle of the Cabernet Franc. It was also a 2011 and it was life altering. This one just floored me. Again, the fruit is from the western side of the Shenandoah, so it might have escaped the worst of the rain. It was big for a Cab Franc. There was a bit of coffee on the nose, with cassis and black cherry on the palate. It had soft tannins and just the tiniest bit of pepper in the finish. For a winery that just opened in February, Gauthier just knocked this one out of the park. I’ve talked about the history and the wine; can there be more? Quite a lot actually. Gauthier is employing sustainable practices and use exclusively solar power for the tasting room complex. They do a range of charitable events for first responders and wounded warriors, with fifteen percent off for military visitors. Picnics are encouraged and the winery is friendly to both children and dogs or even children with dogs. So Gauthier is participating in and supporting the local community in a part of the state that needed another good winery. It’s in an area that has much to offer and it’s nearly impossible to drive through Hampton Roads without passing very near to the winery. It’s just a couple miles off of Interstate 64. Nothing like great wine at a beautiful new winery. If I were you, I’d definitely stop in. The Spratley family farm in Surrey Virginia once raised carriage horses for use in the New York carriage trade. The property is now owned by the David and Diane Sheldon, who repurposed the land for viticulture. The Sheldons started growing grapes at a nearby property in 2008 and then expanded their planting to the old Spratley estate in 2013, which boosted their total acreage under vine to fourteen. Then in November of 2015, they opened Hampton Roads Winery on the property and began pouring wine under their own label. The new tasting room and event building was constructed with a carriage house design to give a nod to the history of the property. There is still a bit of construction, landscaping and interior design remaining, but the tasting room is ready for business. Diane toured me around the rest of the building. There is a banquet room at the rear, space for retail of light food in a sort of cafe and the patio still remains to be constructed. The grand opening is scheduled for April, so there is time to sort out some of the remaining details. Diane is the winemaker and her background in chemistry has predisposed her toward that pursuit. She previously made wine for home consumption, so she has some previous experience. At the tasting bar, she was pouring six Hampton Roads wines. There were three whites and three reds. All were well crafted and showed real promise. The Chardonnay is made from west-coast fruit, but all of the others are estate wines. I passed on the Chardonnay, because I was more interested in seeing what they could do with the local grapes. I was extremely partial to the White Oak White, which is probably the most popular white. It is a blend of Chardonnay, Seyval Blanc and Viognier. Its nose was full of peach and honeysuckle with big stone fruit notes on the palate and perfect balance. It is a lovely wine. Among the reds there is a Cabernet Sauvignon and a sweet red blend that is the wineries crowd pleaser. I have to point to the Cabernet Franc, however, as my top pick. It is a medium bodied wine that is full of red fruit and hints of spice. There is just the bit of green pepper in the finish, but that did not overpower all the things that were right with the wine. I anticipate great things with some of the later vintages. Getting there from Charlottesville was something of an odyssey, but I do not think that is the primary market. If the James River ferry is used, the winery is just 20 minutes from Williamsburg and it is probably 45 minutes west of Norfolk. This is also a region is filled with Civil War and colonial history sites, so despite the rural location, there are many other local reasons to visit. Hampton Roads Winery is definitely worth our attention. I suggest getting out there for the grand opening. I will run some announcements in advance of that event. If that does not work, they are also planning a Hot Air Balloon Festival on May 20th, which should be a blast. I will be stopping in again this summer to see how things are coming together. In the mean time, try to drop in. After you do, Let me know what you think. The Hampton Roads is sporting a new winery, which gives that region its sixth and the state’s first urban winery. Mermaid Winery, in Norfolk’s Ghent neighborhood, showed up on the Virginia wine map in 2015. It seems that they have been around longer, but may not have been making their own wine. The truth is that Mermaid has more of a wine bar feel. Indeed, the tasting on the night I visited was centered around European wines. It is a cute little place in an upscale commercial neighborhood filled with restaurants and other small businesses. There was a very large crowd when I arrived and everyone seemed to be having fun. There is a small tasting bar just inside the door, which is devoted to pouring whichever wines are currently being featured. It is a free tasting, but I passed on it, because I was far more interested in checking out the Mermaid wines. All of the Mermaid wines are not produced from Virginia fruit. They are very up front about that. Much to their credit, there is no attempt to disguise the origin of the grapes. Mermaid has about 1.5 acres of white varietals in Gordonsville (Central Virginia) and import red varietals from California’s Central Coast. None of the wine is currently made on premises, but I am told that may eventually change. The red wines are made a Castle Gruen and the whites at Horton (both in Central Virginia). I purchased a five-wine tasting flight from the bar. Tastings are self guided. Since it was a lovely evening, I retired to the patio, where I could spread out, concentrate on the wine and take notes. The whites included included a lightly-oaked Chardonnay, a white blend made from Viognier, Petit Manning and Roussanne and a peach and Viognier blend. The reds were single varietal Merlot and Cabernet Sauvignon. I enjoyed all of the wines, but I was particularly fond of the all-grape blend and thought it represented Virginia well. With a full-service restaurant and extensive wine list, Mermaid does seem to be more of a wine bar. Nevertheless, they are on the wine map and pouring Virginia wines under their own label. This does serve to highlight the Commonwealth as a wine producer and brings local wines to a part of the state that did not previously have a winery. In addition, Mermaid’s role in educating palates should not be understated. 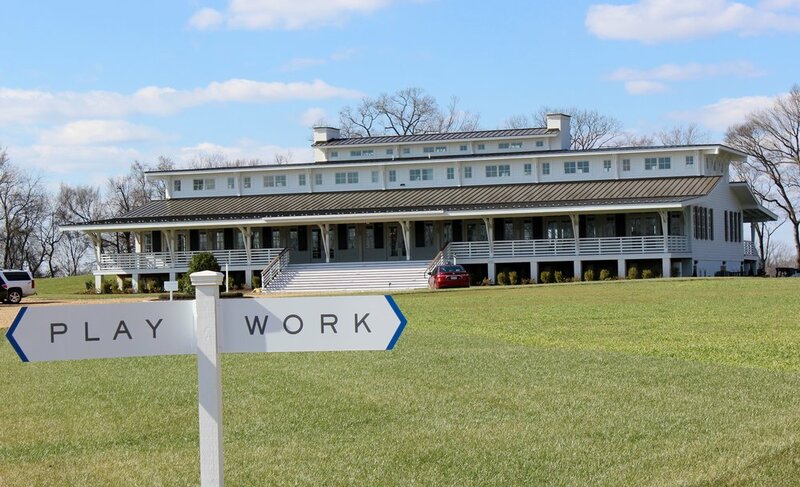 Serving patrons both Virginia and world wines lends credence to the state’s role as a major wine producer. In the end, I would certainly return to Mermaid Winery. I loved the ambiance and the energy. Next time, I will stay for dinner and check out a few of the other wines on the list. So if you are in Norfolk or happen to be passing through, give this small urban winery a chance. If you happen to stop in, please let me know what you think. Roughly midway between Richmond and Williamsburg, you’ll find New Kent Winery about five miles north of Interstate 64. The winery was conceived and constructed as part of a larger community of developments, which seems almost counterintuitive, but it somehow works. As you make the drive from the interstate, there are few clues that this is not a rural, winery location, except the series of traffic circles. There are five tracts of land designated for development and a Reese Jones Golf Course, but only the gates are visible from the road. You will also drive past strategically placed acres of vineyards, which belong to New Kent. It gives a decidedly rural feel to a development that is distinctly suburban. According to Pete Johns, the Vice President and Managing Partner for the development, the winery was built first and is intended to be at the heart of a the larger community. The Vineyard Parkway won a national design award. Like I said, it does seem to work. The winery structure is one of the few buildings visible from the road. It is constructed entirely of recycled material and has also received multiple design awards. It is a beautiful structure with an open floor plan and a spacious covered porch that provides ample outdoor seating for guests. New Kent planted their first vines in 2001, bottled their first vintage three years later and opened the tasting room in 2008. Today they produce about 6000 cases per year, which makes them a medium-sized boutique winery. According to Pete Johns, the long-term plan is to upgrade the winemaking facilities and grow production to about 20,000 cases. This will eventually involve cultivation of additional vines, but it may be several years before that is necessary. New Kent Winery, which is the focal point of the community, was conceived with the intent to produce world-class wines. Toward this end, winemaker/consultant Tom Payette was contracted as a member of the team. Tom is something of a celebrity in wine circles. He has made wine in California and Virginia, but consults across America. His achievements resulted in his selection as Winemaker of the Year in 1999 and is the only Virginia winemaker to have earned that distinction. So it’s safe to say that New Kent is serious about producing quality wine. There were eight wines available for tasting when I visited. Of these, only one was a red. New Kent only produces a Meritage and a Merlot. I tasted the 2010 Merlot, which I thought was very good. It was on the lighter side, with a cherry nose, red fruit on palate, a bit of spice and round tannins. It was a very well made wine. New Kent produces a line of sweet wines in response to customer demand. I will say that while I do respect any well-made wine, I am not one to drink sweet wines. Nevertheless, I found one of the wines to be of particular interest. There is a NV White Norton, that contains three percent residual sugar. I’ve never tried a white Norton, so I didn’t know what to expect. The wine is really more of a rosé. The thick skins bruise when they’re pressed, so it’s impossible to create a truly “white” Norton. In any case, it was exceptionally good. There was a perfect balance between the sweetness and the typical “Norton” mid-palate acidity. It had nice honey notes and a very smooth finish. It was a remarkable wine. Robert was at the front desk when I arrived. He was extremely helpful, took his job very seriously and supplied lots of information about the winery. My wine steward was Chrissy and she was absolutely fabulous. She really knows wine and is familiar with all the particulars of the New Kent operation. She made every effort to make the tasting experience fun and educational. If the Virginia Grape gave awards, Chrissy would receive a Certificate of Wine-Pouring Excellence. But there is no such thing. So as lame as it sounds, I can only bestow my eternal gratitude. It was a great visit at a lovely venue. The service and the wine were excellent. It’s a little off the beaten path as Virginia wineries go, but well worth the effort to stop in. You need to see for yourself why this wine-oriented community has won so much recognition. Last Saturday we traveled over to Sandbridge to spend a day at the beach. Sandbridge is just down the coast from Virginia Beach, but it’s far less commercial and not nearly as crowded. Anyway, I looked at the winery map and noticed that Pungo Ridge Winery was just eight miles away. We’d already planned to visit a couple wineries in the Eastern Shore AVA on Sunday, but we were just so close. What could I do? After lunch, I excused myself and drove over to check it out. I located the winery in the semi-rural Pungo section of Virginia Beach. If not for the Pungo Ridge sign on the barn, I wouldn’t have known I was in the right place. It’s a small operation. The owner and winemaker, Fred Havens, was engaged in some maintenance efforts in front of the outbuilding. He stopped working and asked if I was there for a tasting. I replied in the affirmative and as we walked toward the tasting room, I enquired about his grapes. He quickly set me straight. 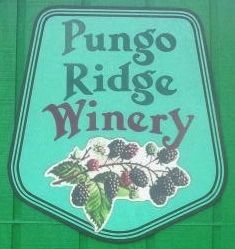 Pungo Ridge produces fruit wines. I have to be honest; I was a bit dismayed. I’ve only had a couple fruit wines that I’ve found reasonably palatable. Most have been huge disappointments. Well, that’s an understatement. Most of them have been just plain awful. As a result, I’ve been very reluctant to try more. But it was too late, I’d already committed and I was unwilling to offend the winery owner. So I followed him into the tasting room. Now Fred was originally a photographer and started making wine in the 90’s as a hobby. He produced enough wine annually to give as gifts and use for family consumption. Over time, his interest, understanding and skill grew until, three years ago he decided to go public and opened Pungo Ridge Winery. His father, Eugene, who functions as the winery manager, assists him with day-to-day operations. Since it’s official opening, Pungo Ridge won it’s first medal up in the Finger Lakes and it is proudly displayed on a shelf in the tasting room. Fred graciously entertained all of my questions and spoke with great passion about his wine and the fruit he uses to produce them. They have five acres that accounts for over half of their fruit and the remainder is purchased from other Pungo Ridge farms. So all of the fruit is local. There are currently four wines on the tasting menu and there are plans to add a couple more next year. As for the wines, this was a life-altering experience for me. I discovered that fruit wines, when well made, can be exceptionally good. The Blueberry Wine had depth and character that I would not expect to find in fruit other than grapes. It had real complexity and on the palate it opened up with the kind of berry notes that one might expect in Merlot. There are no “white wines” per say, but the Pear Wine was a lighter fruit wine that did present a kind of white-wine character. A third standout was the Strawberry Wine, which not surprisingly had strong strawberry notes on the nose and palate. It was slightly sweeter than the others, but not overly sweet. I can certainly see this accompanying dessert at a summer picnic. There honestly is not a bad wine in the lineup. So I’m big enough to admit that I was wrong. There are good fruit wines to be found in Virginia and I found some of them at Pungo Ridge. This small winery is producing quality Virginia wine and I predict that Fred and Eugene Havens will soon have more than one medal on the tasting-room shelf. Unfortunately, I don’t have much information to share. My wine steward was very new and was unsure of many details. Despite being assured a reply, I appealed to the manager in a series of emails to no avail. No facts were forthcoming and the website is bereft of meaningful content. So there you go. Sadly, I can only tell you what I know. I had visited Saudé Creek once before and that was during winter, so it was difficult to gauge the real beauty of the property. The tasting room complex is amazing in any season. There is ample seating on the wrap-around porch, the upstairs balcony, the back deck, around the fire pit or in the tasting room. There is no shortage of seating options. The interior is spacious with exposed wooden beams and lots of natural light. With its frequent music events, it’s a great anchor for the handful of wineries in New Kent County. You can immediately tell that it’s a popular destination. I have no idea how many acres Saudé Creek has under vine, but I do know that Viognier, Traminette, Chambourcin, Petit Verdot and Petit Manseng are grown on the property. They must lease additional acreage or purchase fruit, because there are varietals on the tasting menu that are not included in the list of estate varietals. I do, however, know that the first vintage was bottled in 2007 and the tasting room opened in 2011. So they are pretty new to the industry. John Britt and Jason Knight are the owners. Their stories are a mystery to me. I do know that one of them manages the vineyard and the other makes the wine. So I tip my hat to the both of them. For such a new winery, they are making some very nice wines. There were eight wines on the tasting menu. All were well crafted but a couple were of real note. The Vidal Blanc was crisp and off-dry with refreshing peach notes. I can see this as a summer go-to wine for picnics or sipping on the deck. I drew several stars on the tasting sheet next to the Cabernet Franc. It was young, but of obvious quality with smooth tannins, black fruit, complexity and a bit of pepper in the finish. I’d love to know where they source those grapes. I did take my time wandering around the grounds taking pictures. As I said, it’s a beautiful venue. I’ll certainly stop in again and, if you’re in the Hampton Roads area, you should do the same. Let me just begin by saying, “I am excited.” Twenty miles east of Richmond, in the Hampton Roads Wine Region, a new destination winery has opened on the bank of the James River. It is easily the region's most spectacular wine venue located on the grounds of the historic Shirley Plantation. When Upper Shirley Vineyards opened on February 27th, it was only the eighth winery in the region, but it is certainly a showpiece that will draw visitors from all over the Commonwealth. It was just dumb luck that I visited on opening day. I was in the area and thought I would seize the opportunity to drop by. The soft opening was the night before, but to me it appeared as though the winery had been opened for months. The staff appeared well trained, well rehearsed and extremely customer oriented. Everything was in its place and for a largely unannounced opening, there was a decent crowd. The general manager, Daniel Wurzer, showed me around the property. His winery experience began in Austria and he worked more recently at Early Mountain, which has a program similar to Upper Shirley. His enthusiasm and understanding of the operation came through as he showed me around. We walked through the large event space at one end of the building that looks out on the river. Then we proceeded back to the tasting room, which is also a dining area complete with hostess, waitstaff and chef. The menu is upscale southern fare, which can be paired with the Upper Shirley wines. Daniel seems to be on top of every detail and his extremely enthusiastic about his opportunity to build the operation from the ground up. After showing me around, Daniel handed me off to owner Tayloe Dameron, who was on hand for the opening. Tayloe poured my wine and gave me a little background on the winery. Tayloe purchased the Upper Shirley estate in 1998 and began to look for ways to make it economically sustainable. The idea for Upper Shirley makes perfect sense, when you know that Tayloe is partnered with Michael Shaps, who is also one of the best winemakers in the state. So beginning in 2013, he began planting grapes on his property. Today there are 16 acres under vine and additional acreage leased is in Orange County. So there is more than enough fruit to bottle the 3000 to 3500 cases that carry the Upper Shirley label. There are also plans to increase that number to over 7000 cases and move them through the tasting room and onsite events. But what about the wine? Well, Michael Shaps is the winemaker, so I probably do not need to say more, but I will. Tayloe poured seven wines. We started with a dry style Rose that is so good, Tayloe was thinking about setting it aside for himself. No kidding, it is simply amazing with its big strawberry notes and bracing acidity. I will also say that the Viognier was also a standout, but I was particularly taken with the Cabernet Franc and the Zachariah Bordeaux blend. The Cab Franc was full of ripe fruit and a nice hint of black pepper in the finish. The Zachariah, on the other hand, was one to write home about. An amazing nose was followed by layers of complexity, structured tannins and a finish that went on and on. It was my favorite in a lineup that contained nothing but great wines. So there is every reason to visit Upper Shirley Vineyards. It is on the same property as America’s oldest surviving plantation, which is visible from the tasting room. The service, food and wine are exceptional. On top of of all that, the beauty of the venue will take your breath away. What are you waiting for? Make the drive and after you do, let me know what you think. Virginia's Hampton Roads Wine Region contains only five wineries. One of these is located near the old colonial town of Williamsburg, from which it draws its name. I’d been to Williamsburg Winery on one other occasion, but I wanted to take more pictures and make some better notes. That was all the excuse I needed to return. The winery sits on a 300 acre farm known as the Wessex 100. The numerical designator “100” is a reference to the number of people the tract of land could support. Historically, the property was engaged in viticulture well before the modern age. In an effort to reduce its dependence on French wine, England hoped that the Americas might prove suitable for wine production. English law required that each farmer plant ten vines for the purpose of making wine. So grape cultivation on the property dates back to the early seventeenth century, but without any substantial success. English hopes for a robust American wine industry were never realized. Sustainable viticulture on the Wessex 100 did not begin in earnest until 1996, when Williamsburg Winery planted their first grapes. The winery currently has 33 acres of grapes and has long-term plans to increase to 100 acres under vine. Williamsburg has grown, over this short period, to become the largest producer of wine in Virginia with an annual total of about 50,000 cases. The volume of production has not seriously impacted the quality of the wines. Williamsburg consistently medals in state and national competitions. In addition, for each of the last five years, Williamsburg wines have earned medals in London’s prestigious Decanter WorldWine Competition. So they’ve got a little "street cred." A visit to Williamsburg Winery can include a tasting or a tour, which includes a tasting. On my last visit, I just did the tasting, so this time I decided to tag along on the tour. It was worth it. We walked through the barrel rooms, reserve room, bottling room and the room that houses the fermentation tanks. There’s also a small museum containing artifacts recovered from the property and the owner's private wine bottle collection. It was well done, but with the exception of the artifacts, it was a pretty typical winery tour. If you’ve never done one, it’s worth checking out. The tasting was conducted as part of the tour, so there was a slight sense that another group might be at our heals. Nevertheless, it did not feel rushed. Our wine steward was excellent and knew a great deal about wine in general, so was able to speak with authority about Williamsburg wines. There were seven wines on the tasting menu representing primarily the 2011 and 2012 vintages. There were three whites and three reds with a choice between a 4th red and a dessert wine as the final selection. My favorite white was the 2011 Sir Christopher Wren White, a blend of Sauvignon Blanc, Traminette, Chardonnay, and Vidal Blanc. Traminette dominated the nose with big floral notes and it had lots of crisp fruit on the palate. I found it to be a fairly complex white wine. I chose the 2009 Burgesses’ Measure Merlot as my seventh wine and it proved to be my favorite of the tasting. It had a wonderful cherry aroma followed by lots of red fruit and a beautiful finish. It was a very well crafted wine. Despite the fact that Williamsburg Winery is not clustered among most of the other wineries on the Eastern slope of the Blue Ridge, it is decidedly one of the state's premier producers of quality wines. The property and proximity to America’s other early colonial settlements make this an important stop as you explore Virginia wineries. Add this one to your list.